I set up a stand in Bakery Lane, Petersfield on Saturday. It's a new venture - last Saturday of each month. 10am to 4pm. I'm going to try to be there next month outside The Blacksmith's Daughter florist facing Waitrose car park. This peeling paint door was a perfect backdrop for my old mirror. As usual the handmade buttons sold and the interesting jewellery tempted a few people to say they were going to see more in Tricot Too in Dragon Street. Only three dolls left now. This week I'll be making cats in cardigans for a display in Havant Library from Tuesday July 7th to Friday July 31st. Making clothes with nuno felt is exciting to me now! This picture is in Lizzie Houghton's new book 'Felting Fashion'. The texture, the soft drape and the art to wear one-offness of these pieces is totally inspirational! A keenly fought tug of war. I had a stand at Beech Village Fete on Saturday when all the residents came together to make money to revamp their village hall. I met some nice people and bought some amazing books :'The Fiberarts Book of Wearable Art' - (I might post some pictures from this amazing book later) and the hefty coffee table book called 'Pierre Herme Patissier' with sumptuous photos of strawberry tarts, florentines and croissants and their recipes, both for 20p -not bad eh? 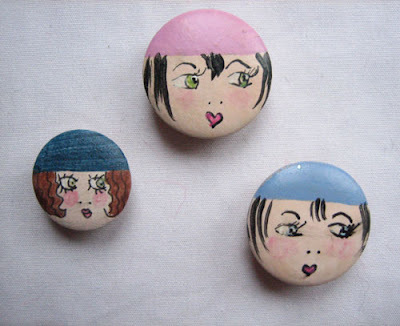 My painted wood buttons are now stocked by The Black Sheep, a new shop in West Street, Midhurst. This week a friend hosted an 'Art Week' in her glorious garden. Her artist and maker friends sketched and painted with all this inspiration around them. So much to see. As we sat chatting half way up the garden three green finches swooped and fed just a stone's throw away. I love the colour and smooth texture of this gate against the pale stone wall. What a paradise! Stone steps lead up through the garden to a vegetable plot beyond a gate at the top. Everywhere there is detail and decoration -smooth sun bleached wood on end as sculpture; chain arches and an amusing scarecrow made of threaded together plant pots. This garden could only have been created by an artist. It is a wonderful achievement. A few flowers from the garden and you can blame the garden for keeping me from blogging this past week. It's so nice to potter about outside and to work on stock and orders outside while the sun shines. And today my kind neighbour lent me her sun umbrella so I can stay even longer outside without worrying about shrivelling up into a dry prune. I am knitting a tunic and it's taking far longer than I reckoned but I think it will be worth the time and effort when it's done. I've asked Rowan if I can have wool at wholesale prices as there are more garments in the pipeline - I'll find out on Monday. I've also been thinking about workshops. What sort of things to teach? I have now come up with a list of workshop options for groups to choose from and I think I will learn from those taking part just as they will learn from me. If anyone is interested in joining a fun creative workshop let me know. More details on request. Saturday June 27th I'll be selling in Bakery Lane, Petersfield - buttons, dolls and badges, not the textile jewellery which is exclusive to Tricot Too in this area. On Saturday I had an enjoyable day selling at Farnham Maltings in Surrey. The dolls were especially appreciated and I'm planning to make a lot more of those. Buttons, necklaces and flapper girls also went down well. Although this is a once a month show for makers and antique dealers the stalls are so popular that I don't know when and if I'll be invited to do it again. My next event is selling buttons and dolls in Petersfield on Saturday June 27th. Then you can see my work in the big display cabinet for the whole month of July in Havant Library. Pretty cardigan worn with one of my necklaces. Love this clean and cool outfit for hot summer days. Red flower necklace with red flower print dress. These are the first two of five dolls I hope to complete this week. I love selecting colours to make the dolls. The other three have hair and painted faces and today I'll try and make their dresses in different colours from those pictured here.